This post comes to you from the Austin Airport Sorry. I ran out of time there. This post comes to you from the sky above Texas. Nope. That didn’t work out either. A cab driving towards the hotel now that I’ve landed in Dallas? Yes. This is working. I feel like various modes of transportation are my main location these days – and it’s just starting to wear a little. Don’t get me wrong, I love the tour. I do – and I mean that. 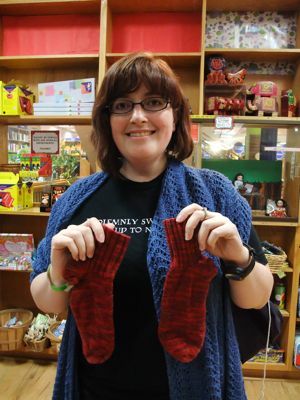 I love meeting knitters, and I love reading from the book – I believe totally that this is the best book I’ve ever written, and I’m proud to be out here supporting it, and huge chunks of it are even fun, and really, there are authors out there who would kill for this chance, and I know that. So believe me when I say that the last thing I want to seem like is ungrateful… but dudes, I am tired. I realized it this morning when despite having a lovely day, a fine evening and eight solid hours of sleep, my only response to waking was a gentle sort of urge to weep softly and drink nineteen cups of coffee. Luckily for me (or I’d really be bummed), I know that this feeling is just a reponse to this phase of the tour. It’s simply too many days without the food I’m used to eating, the bed I’m used to sleeping in, and then husband I’m used to bothering. It’s best not to think about it, since it can’t be helped. so instead of dwelling on it this morning, I got up, drank a cup of coffee (just one, since I know disaster looming when I see it) and I did 30 minutes of yoga and I turned that frown (literally) upside down, and now I’m on my way to the event tonight in Dallas (Fairview, actually) and I’m feeling genuinely happy about it. I think it was a wave of homesickness, and just because you love home doesn’t mean you can’t love where you’re at now too.. right? Right. I arrived at the hotel, changed really fast and left again, after being assured by Brent at the desk, that Book People was only a 10-15 minute walk from the hotel. Well – Brent is either a filthy liar, or he’s never walked ten steps in his life, because 40 minutes later – 40 minutes under the blasting Texas sun, I arrived at the bookstore a shadow of my former self. Enough of a shadow that I drank cold tea when they offered it to me, and I liked it. Good thing I made it, because this is what was waiting for me. 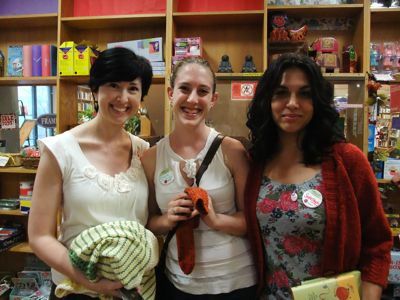 Wave at the charming Austin knitters! I read, I talked, I cursed Brent publicly, and afterwards, this is who I met. Austin apparently specializes in clever young knitters, so I present to you the fine knitter known as Gus. Gus is eight. (He just turned eight. That’s significant.) He’s knitting some beads into his fine knitting. I asked him what he was making, and got sort of a blank look. I asked him then if it was an objet (as in an objet d’art) and after a brief explanation of what that was, we agreed. It is an objet. Please meet the similarly talented Abby (she’s seven, and she knit the scarf she’s holding) and Emily who is nine and three quarters – (The three quarters is, as you may have surmised, significant.) Emily is wearing a vest she knit her whole own self. 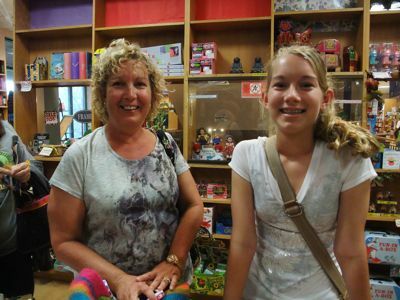 They’re with their clever knitting teacher Mum Carey. She showed me her wedding veil (which is in her hands) and I asked as politely as I could, when she was getting married. Turns out it’s two years. Everything is okay. For several horrible minutes I thought she was going to say "Oh, two weeks". I was going to suggest a wedding scarf. and look at her now! I’ve clearly been at this book thing for a while. I don’t know if that’s encouraging or frightening. In any case, she’s a lovely young knitter. Non-knitter, trying to be nice to his mum. She asked him to come and he did, and there’s nothing more charming than faithfully obeying your mum, even though you’re a grown-up. Not that I’m directing that at any of my children or anything, I’m just saying that Justin seems like a very good person. Finally, last but not least, I want to show you Stacie, Claire and Stephanie. I’m off again, with only minutes to spare before I need to be at A Real Bookstore, but I forgot to mention in my St. Louis post, I signed some extra books when I was at Left Bank Books, because they do mail order. So if you’re one of the people who wrote and asked how you could get a signed book if I’m not coming to a town near you? Left Bank Books. I can’t believe there aren’t any comments yet. I’m assuming a technical problem.. I love Gus- a real process knitter- who cares what it is, I’m knitting. I think all 8 year old boys knit this way. Heck, they live life this way. At least mine do. Hope you get over the homesickness until you get home. Enjoy the rest of the book tour/yarn crawl. Your blog entries are so much fun to read. 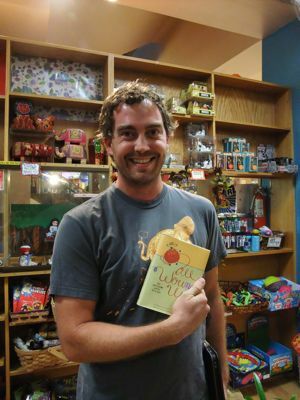 Thoroughly enjoyed your reading and book signing in Austin. It was so much fun. Glad I just happened to be in town visiting from Florida. There really is NOTHING sweeter than a grown man doing something he isn’t interested in just because it will make his mom happy. Thanks for introducing Justin to us — it made my day. I am now officially kicking myself for staying home all day in my pjs rather than making the 3 hour drive to Austin yesterday. How is it that both you AND Ysolda were in Austin on the same exact day? However, the inside day was needed. And I got tons of knitting done. P.S. Austin is pretty great. If they had a decent job market in my industry, I’d live there in two shakes. Girl, you are killing me. You can’t tell me that you had a joke that you found worthy of repeating and then not tell us the joke. Bring it on! My God, if you get through this tour without falling ill from exhaustion, it’ll be a miracle! Of course, we’re all wondering how Gwendolyn is doing. Will you be going anywhere cold enough to wear her? (And is your family back home engaged in the furnace wars in your absence?) Hang in. Brent really wasn’t very nice, was he… 40 minute walk in Texas is not for the faint of heart. I love, love love your post and photos! thanks! Love it. 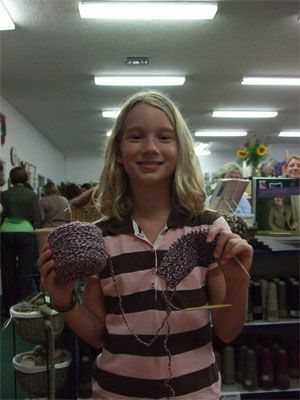 I was a ten-year-old new knitter once. 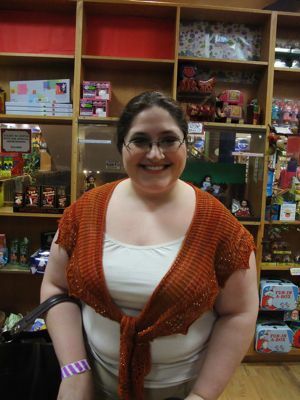 Love that the Knitting Nest had a t-shirt to rescue you with and that they did. 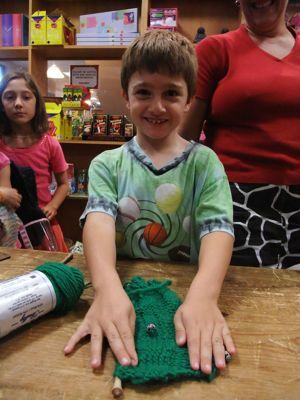 And Justin proves that not only are knitters nice people, they raise nice people; well done! That Gus has great taste! He’s knitting with Brown Sheep yarn! Go Nebraska go! 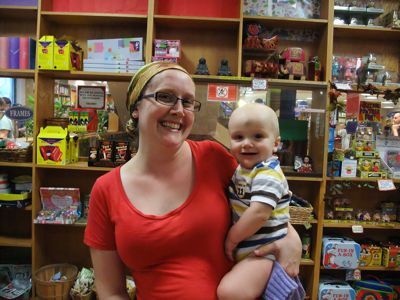 My baby and I made the Blog! I can’t tell you how famous that makes me feel. Ha! So I have had such a good time reading all these posts, and was thinking, “Those lucky folks.” Then I had the sense of mind to check the schedule – you’re going to be near me on Thursday! What luck! I did a little squealing sound. I’m glad no one else was home. See you then! I’ve already made 4 bridesmaid shawls since getting engaged in may. This veil thing is going to happen! You’re right-it is your best book yet! Loved every page-thank you so much for writing it! Seeing and hearing you yesterday made me homesick for good ol’ Torronoh. When it’s January, and the wind chill makes it feel like it’s -32, come back and visit us in Weird Austin. Please, please, please, please come to Cleveland. We have good beer and cute babies! And in case Stephanies Mom was wondering, she wore the beige AND the necklace. I’m glad you got some yoga in. It does tend to make life better. Hope the rest of the tour goes well. Now that I know you actually read these: thanks for hanging out last night. You are truely a gracious and ridiculously funny lady. 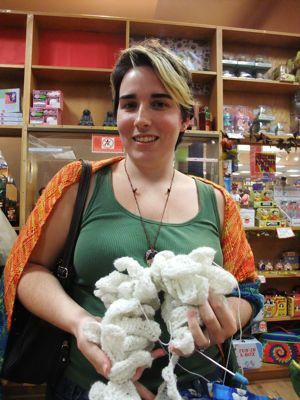 Stay strong, Steph, you are making thousands of knitters extremely happy all across the continent! Powell’s will have extra books, too, and your can pre-order them. I, for one, am glad you are on tour, as I get a NEW blog each and every day! I still think it was cruel of the Knitting Gods to double book TWO Über-Knitters in the same city. Thank you for being gracious and having a sense of humor and I hope you get some rest soon. I feel a teeny bit bad for Brent. After all, no one walks in TX, so how would he know, really? And also, now there are a lot of people with pointy sticks who know his name and where he works. And the parade of fabulous first socks is really knocking me down a peg! 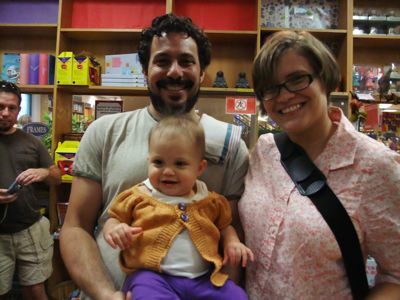 The last time a book tour brought you to Pittsburgh, my daughter was 3 months old. She’s now 4 1/2. The posts about the brothers had me in almost tears. The post about the WONDERFUL son, made me smile. I hope that my sons and daughters would do something nice for each other. My daughter did make my son, “That Chocolate Cake,” when he visited her in Atlanta, Georgia. I can believe that you are exhausted and missing your “peeps,” and routines. As always, you amaze me. Down here in Texas, we just call it tea. If you want it hot, you have to specify. Thanks for an entertaining afternoon. 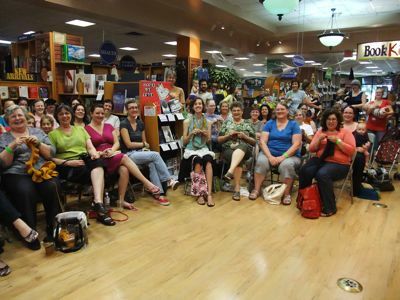 You had some of the non-knitting BookPeople staff cracking up. I love all the knitter stories. Thanks for sharing. It’s like I’m there (but, again, I’m not). I know this is your best book. Even though I’m still patiently awaiting it’s arrival. How cool… you spoke in a church. I’ve knit in lots of churches and I’ve prayed a bit while I’m knitting. I think it goes together nicely. Thank you for the good pictures of the crossed cables repair. You made it look easy (except you didn’t show the kitchener part which is harrowing for me). Hopefully it will embolden knitters to give it a try. Ah, Austin is wonderfully weird, and Book People is the best — I’m jealous! But too bad you didn’t get to go to Hill Country Weavers, it’s lovely and in the funky South Congress area, which has loads of authentic Austin weirdness. Next time? And Powell’s? You once put the Harlot in a tiny Garden branch. We’ll believe you have extras AFTER the signing. Hey Steph- I hope that you get a break before too long. We’re looking forward to seeing you in seattle. Hope you’re still breathing by then. Glad you kept your shirt on.Suprised you didnt jump cab. It must have been tempting. Love the 8 yr old who knit her own vest. You go girl. I agree, Justin needs a good knitter in his life! Maybe one in Atlanta? When will you be coming to Georgia? Although Atlanta isn’t as weird as Austin…there is certainly weird here! Come for a visit for iced sweet tea! Love the posts! It was a really wonderful reading; thank you so much for coming to Austin! Gus has gotten a huge kick out of seeing himself on your blog too. 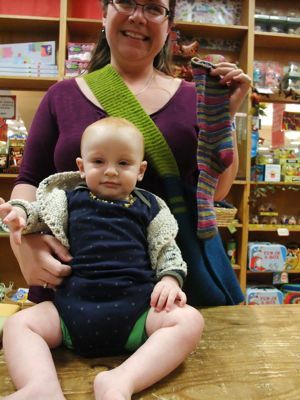 From the weirdo capital of the US(not to be confused with “keep it weird”): I love the photos of the non-knitters but my favorites are the babies. They look so happy! Love reading the blog! I have the Kindle copy ready to read, but I can’t read and knit furiously at the same time. (I do have your audiobooks). hehe. A devoted blogger beyond belief. Not only do you get to have all these adventures, you share them! As much fun as it must be, there’s still no place like home. Hope when the tour is over, you get to stay at home, in jammies, doing whatever you want for a long time. I can’t imagine a two week stint in hotels, on planes, in cars, on foot, and whatever mode of transportation I forgot. I know your family will be thrilled to have you back. 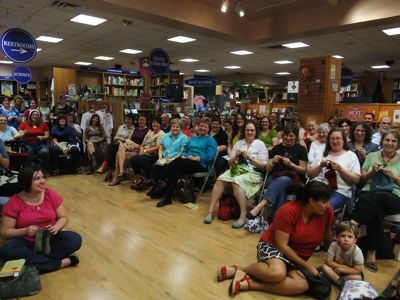 Thank you so much for sharing your book tour, it is really nice to see fellow knitters from around the country and world! I’m so jealous of those lucky cities on your tour. Thanks for sharing it with us, I’m enjoying it at least vicariously. By the way, to wear those knits in that hot climate shows real knitting dedication! Steph, your travelogues are so enjoyable; I’m so glad you keep them up no matter how tired you are. I’m in the middle of reading your book and I have to agree that it is your best yet. However, I have a question: the sweater that is relegated to the closet for being too simple (chapter 14, I think) – would that happen to be Joe’s Gansy? We haven’t heard anything about that garment in a long time, and since you’ve already spilled the beans about the “sweater in the closet,” you might as well go all the way and tell us which one it is. Mkay? I sure hope I get to hear you speak again. I was at one of the very early stops in Skaneateles and enjoyed every minute of it. I’m also impatiently waiting for my copy of your latest to appear in my mailbox (scheduled for the 27th)! Dear Stephanie, ever thought of doing an Australian book tour??? We’d love to have you here. You can even bring your husband along so you can still bother him !!!!! Thank you so much for including the picture of Justin on the blog. I was scanning the crowd closely to find him before I reached his pic. What a sweetheart!! I am a thousand miles east of Austin so couldn’t get to the book signing. This young man is one of the dearest people you would ever wish to meet. And has a killer smile. I’m not biased much, just his Mother. One of the things I like about traveling is the fun of discovering how different we are and yet still the same. This seems especially true when it is food! Sweet tea, chickory coffee, grits, boiled peanuts, pralines…and everything else fried, dipped in barbecue sauce or slathered with mayo. I always have problems finding healthy vegetarian food, but I still love to visit the south. Such nice friendly people and I hear they make some great beer in Texas too! Enjoy your stay and good luck on the rest of the tour. Weather update: just in case it’s still hot in Dallas, and you don’t get to wear Gwendolyn, it’s almost raining in L.A. So . . . you can wear it in Pasadena! Can’t wait!! Fabulous! You get to meet the greatest people! And what a tour. I love reading about it. Not dull by any means, it is a real life adventure. I love the photos. Those babies and everyone else are all smiling. Makes me smile too. Thank you!!! So many bespectacled folks, yay! Even though I ordered the book a week ago from the closest source (book depository) it takes a week or TWO to get here…arrgh. I am rather jealous of you having all of these attractive young men coming to your signings! It’s great to read about your tour. 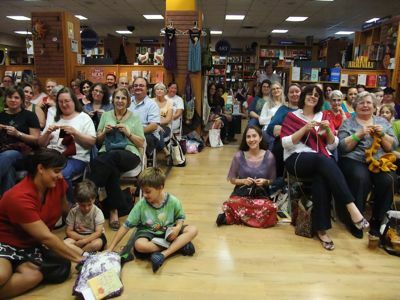 So many knitters, all these smiles. Knitters are a happy people! And I’m happy too because I’m reading a copy of your book in little Belgium where knitting seems to come back into fashion… at last. Good luck with the rest of the tour. I’m glad that the tour is going well and wish that the homesickness was easier to cure than the application of yoga, coffee and beer (I’m assuming that a little bit of beer has to be in there). If you make it back up to Boston again in the tour, unlikely I know, then I hope it is after the show, so I can actually see you talk. It was so much fun the last time I made it! an 8 year old making an objet makes me feel very inadequate. I love these book tour posts. Any chance you’ll be doing a tour near home in TO? I haven’t picked up your book yet but it’s on my list. I think you mentioned that the pick up truck story was in it which is one of my favourites. Blasting Texas sun?! Heck, I live an hour and a half away from Austin and we’ve been enjoying the “cooler weather”!! Good thing Austin wasn’t a month earlier in your tour! Sorry I missed y’all in Austin! 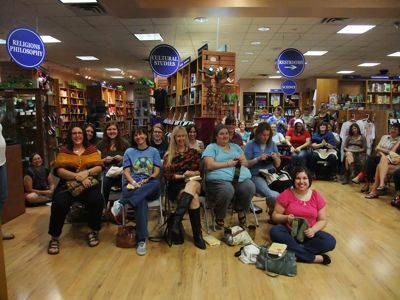 But I’m glad plenty of Texas knitters came out to represent. texas is an awesome state. last time i was there (in san antonio) i came home with a pair of hot pink and black cowboys boots i bought at the rodeo(no beer was involved). I hope this helps with the rest of your book tour! You are in the home-stretch! Three more events and then HOME to your own bed! Looks like fun! What I’m dying to know is what hat Claire (or is the mum Dorothy?) is wearing. The one with the lattice-y colorwork. Lovely. Someone recently said to me that they didn’t think young people are continuing all the wonderful crafts that had a resurgence in the 70s. I immediately thought of your blog and the wonderful pictures you post, and I said – Not true at all! And I wrote down your blog url. I was wondering about Claire’s hat too! 40 minutes in the Texas sounds horrible. Of course, here in the Upper Peninsula of Michigan we’re supposed to get snow tomorrow… maybe it doesn’t sound so bad. I didn’t make your talk here in St. Louis because my weekend was so busy I was actually glad to get in the office and rest a bit! But I have to share this story with you. This weekend my mom – who watches America’s Got Talent faithfully – told me she thought I should be on the show. Well, I do play piano but haven’t practiced in years and I’m pretty sure paperwork isn’t a talent so I asked what I would do. She said I should knit. Also, it should be a sock because making a foot shaped object out of string is truly magical and a sign of talent. 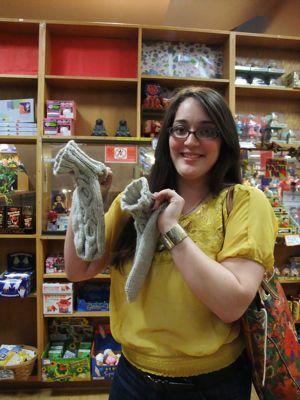 Oh and she’s not a knitter so I was charmed that she thinks sock making is a talent. LOVELY audience –happy people. Now, I know you put in loads of effort and sacrifice to show up with a smile, BUT could you be happy if you were a political writer. Just saying the subject of the book creates the atmosphere. So knit, smile, meditates and soon all will be a memory as you put on your frump clothes with your family. When I am providing food, whether for a potluck, a school party or a gathering at my home, I try to determine if those who will be eating the food have allergies or other food-related issues, and then I cook accordingly. Without being pushy about it, you have made it clear over the years that you’re vegetarian. So, I’m surprised that more of your hosts haven’t managed to direct you to a good vegetarian restaurant (offering to pick up some carry-out for you if you’re short on time) or at least asked another vegetarian knitter if she or he could bring some food when coming to your talk. I know everyone’s busy, but it would be the polite thing to do. I was in Austin once for a week attending a conference. It was 108 degrees all week. Never. going. back. you’re doing great Steph!! Keep up the momentem! I truly sympathize with you about being tired. As I’ve followed your travels this past week, it’s understandable that you should be a bit drained. Having said that, I just love to follow along on your posts. The people you meet along the way love you as much as we do and are lucky enough to be able to gush a bit as you sign their books. All those good vibes should keep you going! I Love Austin!! 🙂 Hope you survive your trip to Texas! I know we all adore you here! Werewolves of london is my ringtone! I love that song! not sure about the whole shirt thing! That’s the cab driver I’d get. Every. Single. Time. I have that kind of luck. Ugh. I only learned you were coming to Austin on Thursday and showed up more than an hour early and the seats were already half full. Two more groups of chairs were set out and still more people arrived. The woman next to me had driven eight hours from Monroe, Louisiana to see you. I couldn’t understand it until I heard you speak. Not only do you write wicked humor, but you have great comic timing. I am now reading your posts from the beginning, having read your book twice. I was so looking forward to coming and seeing you at Powell’s on Friday, but my car just stranded me and my two children on a busy freeway a couple hours ago. Hopefully the shop will be quick about getting my car back to me– but I am not holding my breath. 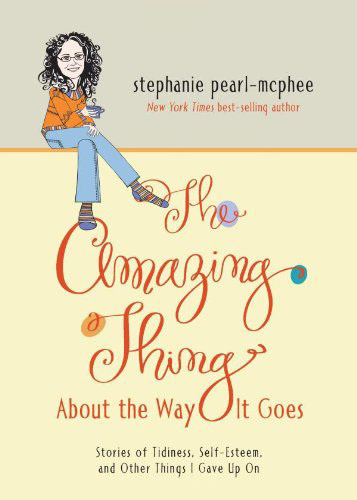 Stephanie, I’ve been meaning to tell you this for the longest – and having just finished about 1/4 of your new book, wiping tears of laughter from my eyes: YOU ABSOLUTELY ROCK, GIRL. YOU ROCK. Love your Autin pictures! All those beautiful socks and proud creators. I don’t yet have the courage, but am slowly working up to it. And those babies and children are squeeeeee cute! You’re spot on about the awesomeness of Austin. When I lived in TX it was my favorite city. I’m glad you had a positive experience. Book People, mmmmnh. Go Gus!! You’ll be meeting my baby Gus on Friday. Hopefully in 8 years he’ll be knitting objet too! 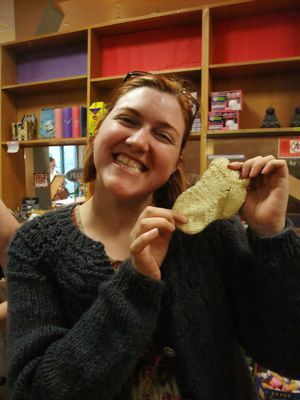 It’s more than a bit surreal to see a photo of me and Dorothy in your blog! We had a blast! 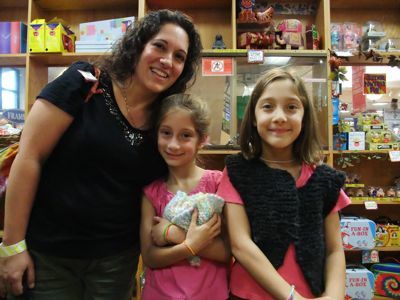 That was the first time I had her in that baby surprise jacket, I knit it before she was born and just now got to sewing the buttons on, right before getting in the car to come to the signing. I’m glad I guessed just right on the size for this winter. The world has a cruel sense of humor letting someone who makes almost all of her gifts have a baby on December 21. How do you keep the names straight for the photos? I know you are a remarkable woman, but…. 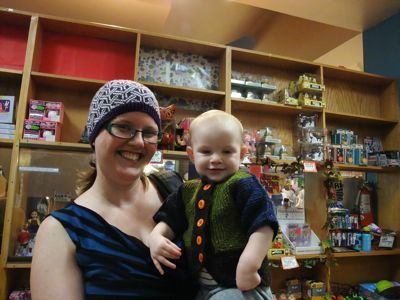 It was my pleasure to drive the fabulousness that is you to the Knitting Nest last Sunday afternoon after Book People. I don’t think I have ever had a more amusing drive through Austin. I never knew that my previously very aggravatingly flapping headliner, (long since removed and exposing many (failed) reattaching gluey and taped efforts) would create such an animated discussion. The analogy of not letting a pattern/yarn “win” in the pursuit of a “perfect” FO in relation to my persistent reattachment of headliner tries is certainly what I was aiming for. That’s my story anyway! Thanks so much for a really wonderful time – great memories! I so love seeing all these pics of young ones knitting because I am hoping that my now 19-month old beautiful boy will become one of these young adorable creative knitters – which gives me the ok I need to knit nearby as he plays. He thinks it’s hilarious when I wind skeins into balls. I’m glad one of us enjoys it. Thanks for the heads up on Left Bank books having signed copies. I would love to be able to have you sign one in person, but this may have to do for now.